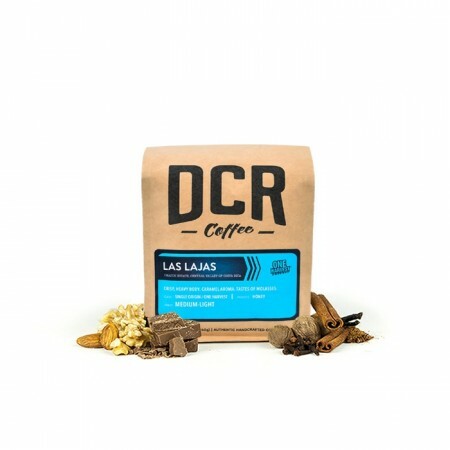 This is the Costa Rica Organic Finca Las Lajas brought to you by Dillanos Coffee Roasters. This coffee benefits from the rich soil of the nearby Paos Volcano near the Central Valley region of Costa Rica. The passion of the Chacon family, which shows in their harvesting and processing is an example of how stellar a honey process coffee can be. This coffee is rich and full bodied with a caramel aroma and deep molasses-like flavor. Not my favorite, but not awful. The smell was a bit off for me, reminded me of pizza crust. Not necessarily bad. But also not really expected. Great, smooth coffee. I really like this coffee. thanks! I liked this coffee and it's the first time I try light roast. I would like to try some dark roast with chocolatey/nutty flavors next. I don't really like light roasts, as I specified in my roast preferences. I was a little disappointed to receive a light roast in the mail. Many florals in this cup. We enjoy brewing this in our Able Brewing System for our morning cup of joe. A little too bittery/acidic for my taste. Not really sure why only 3 starts. Wasn't impressed with anything unique even though it was a solid coffee. This was good, a little more citrus than I normally like. I am all about the cocoa, chocolate, almond, and rock fruit coffee's. My first honey process and I'm really blown away. From the bag a peppery sweet aromatic comes through. First cup on my Melitta a rich buttery body and smooth sweet light caramel flavor notes. For a light roast, the body and richness is phenomenal. Interested to see what happens on my Chemex. Unbelievably smooth. Doesn't feel washed out though; the caramel specifically is what dominates in my opinion. The Costa Rica has good body, but isn't super flavorful. The caramel comes out, but not getting much of the floral. We brewed it with the Chemex and used their recommended proportions on the package. This may be my new favorite coffee! Delicious every way I brewed it! Fruity with a creamy finish. It was a good coffee but not great. I wanted something bolder. This coffee was subtle. Opening the package I was hit with a sweet honey smell and grinding the beans released the sweet aroma into the air. A chill ran down my spine as the thought crossed my mind that the strong aroma would overpower the coffee and I was nervous to take my first sip. As I lifted my mug closer and closer to my lips, my lifelong experience of coffee flashed before my eyes. The hot coffee flowed into my mouth and down my throat. I paused waiting for the bitterness to follow that I was so accustomed to experiencing from drinking black coffee. Moments later the sweet taste of coffee subsided and the bitterness was nowhere to be found. Overwhelmed with emotion at the possibility of drinking coffee without a bitter aftertaste, I took another sip, again pleasantly tasting the sweet coffee and honey and again the bitterness was absent. My eyes have been opened to proper coffee and never again will I go back to drinking stale grocery store bought coffee. Thank you Samantha! Not my favorite coffee. It was a little acidic for my taste. However, my husband loved this coffee! Very smooth! Mild acidicity which I enjoyed. Not too intense. This was a little bit too light & bright for my taste. That's not usually the case with CR beans I've had so I was a bit disappointed. I liked,partner did not ergo we are a house divided on this coffee.It is a bit "bittier" than we care for, so I havevto be xtra careful on the measurements . I really enjoyed this coffee, it was a smooth roast and was absolutely fantastic in a French Press. Fantastic flavor. However, it was too acidic and so I could only have a 1/2 cup at any one time. Unbelievably delicious though!